Sasya Ganapati is a unique eco-friendly initiative by a group of friends from Bangalore. The Ganesh idol will grow into a plant after the Ganesh Chaturthi Puja. The Ganesh murti is made using natural clay, potting mix and natural fertilizer. The visarjan or immersion is done in terracotta colored uv stabilized square pot. 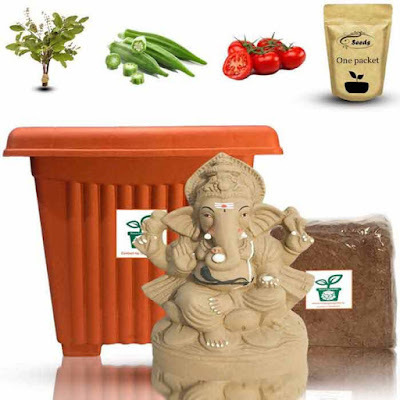 The Sasya Ganapati kit consists of clay idol, pot, plant seeds, nutrient block and a detailed instruction manual.